Space: 1985. Orbiting earth, you are left with little entertainment. That is, until a passing capsule docks with your meandering vessel. Onboard is a collection of magazines with content like you never imagined . . . Space Gamer, issues #27 - #76. Your name is Major Tom. Ok, so maybe that's all fictional, but Space Gamer is not. Now you can get the same issues that this nonexistent astronaut read for half the price, with the Space Gamer bundle on Warehouse 23! That's five years (1980 to 1985) of content, full of general-purpose gaming articles. Fans of boardgames, RPGs, miniature games, game design, and even early computer games will find something interesting in these digital downloads. 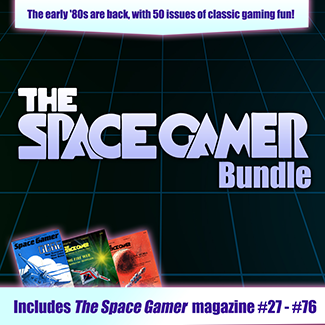 The Space Gamer bundle joins our Pyramid Classic and Roleplayer bundles, all featuring awesomely nostalgic gaming content to fit any niche. So come down, astronaut, and get these classic zines in the Space Gamer bundle!